The handmade 7” Oval Purse is a smaller version of the classic Nantucket pocketbook. It is 7 1/2 inches long and 5 inches wide. It stands 6 inches high. It is sturdy, stylish, and perfect for everyday use. Our hand woven handbags and purses come in a variety of shapes and sizes, each one being a hand woven, and authentic piece of practical art. 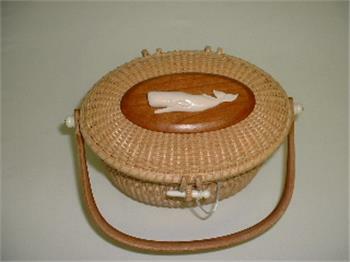 The handmade 7” Oval Purse is a smaller version of the classic Nantucket purse. As with our other Nantucket purses, this handmade purse is woven with cane and reed construction, and it has a cherry wood base, top, and handle. It is 7 1/2 inches long and 5 inches wide. It stands 6 inches high. It is sturdy, stylish, and perfect for everyday use. You may personalize your handmade Nantucket purse by choosing a decoration for the purse’s lid, as well as the engraving on the ivory quarterboard inside the purse.